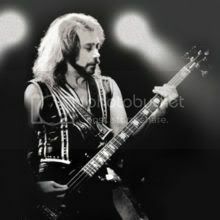 Happy Birthday Ian Hill!!! Cheers! Hey there Devils Child...been awhile!! Well let me be the one to post here for the first time in 3 months..... Shame on you people!! Especially when I was the last one to post here!!! Blah!!!!! Happy Birthday Ian!!!!! Party hard, and never stop rockin'... The younger musicians have got nothing on you!! Ian hill does not get the credit he deserves... He rocks out hard!!! trust me seeing Judas Priest play live i was watching him 80% of the time... The other guys run around and do their thing, but he stands humbly at the back of the stage banging his head along to the beat of the music. Me and my brother have so much respect for this man, and when he gave us the thumbs up at the Brisbane show - it just drove home how awesome he is - he knew we were there for him.. of course we kept screaming out his name.. lol. When he's on stage he's off in his own world, having a great time.. i love that cheeky smile of his. Ian Hill is the MAN! !